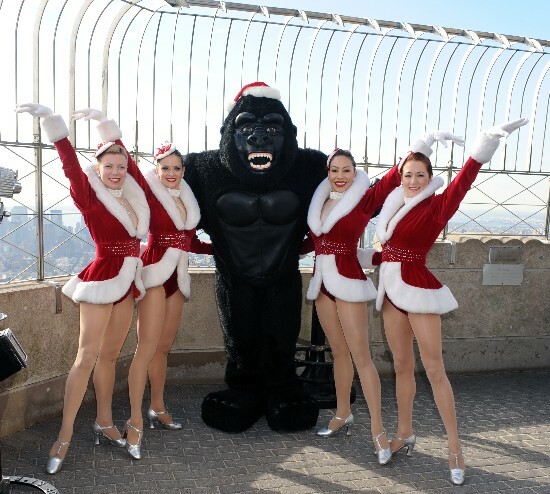 Nothing brings out the Holidays like Gorillas and Rockettes ! O.K. Bull...Go and Get It ! 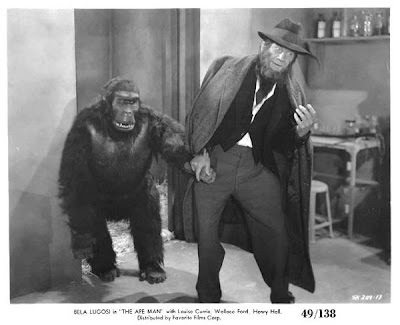 Bull Montana.....A name that strikes awe in the most devoted of gorilla men ! mechanized masks, Bull Montana played apes... without a mask ! In the 1920 film " Go and Get It" Bull plays a fierce ape man named Ferry. 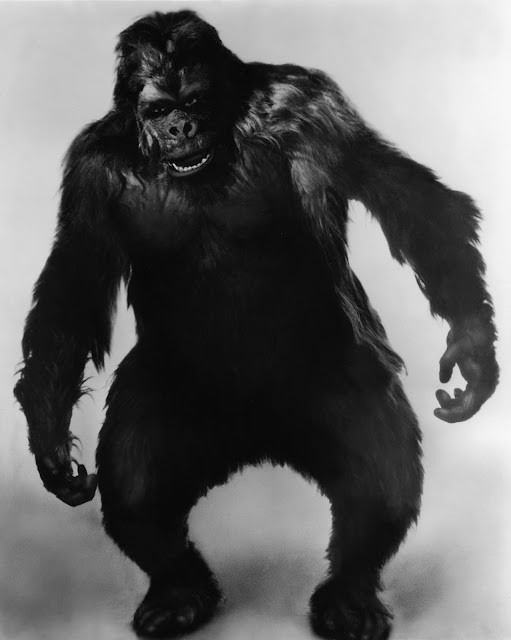 Using materials of cotton, colodian, yak hair, and hand carved gorilla dentures, Holland skillfully transformed the hulking ex-boxer into a gruesome gorilla. The great Charles Gemora had the task of making Bull's fur suit, hand tying the hair a few strands at a time with a crochet needle, into a loose weave backing.
" 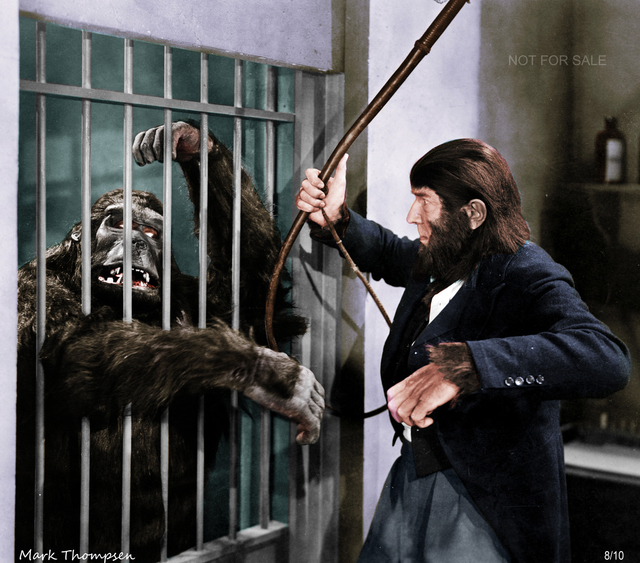 The Lost World" 1925. 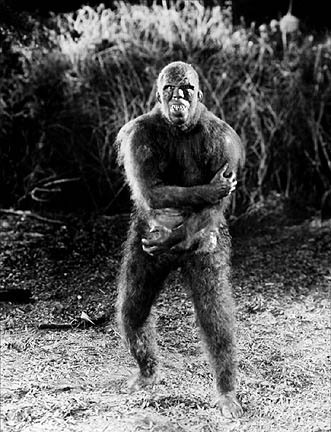 In the Lost World, Bull played an early ancestor of man, who terrorized the Challenger expedition. Bull was filmed fairly close-up, drooling horrifically while peering from behind rocks. 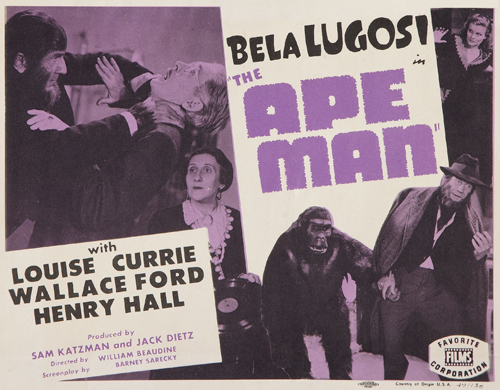 This was a true testament to Cecil Holland and Charles Gemora's incredible artistry ! A very special thanks to our great friend, and fellow gorilla man fan, George Chastain for sending us the fantastic photo of Bull Montana in the Wids Daily Newspaper ! 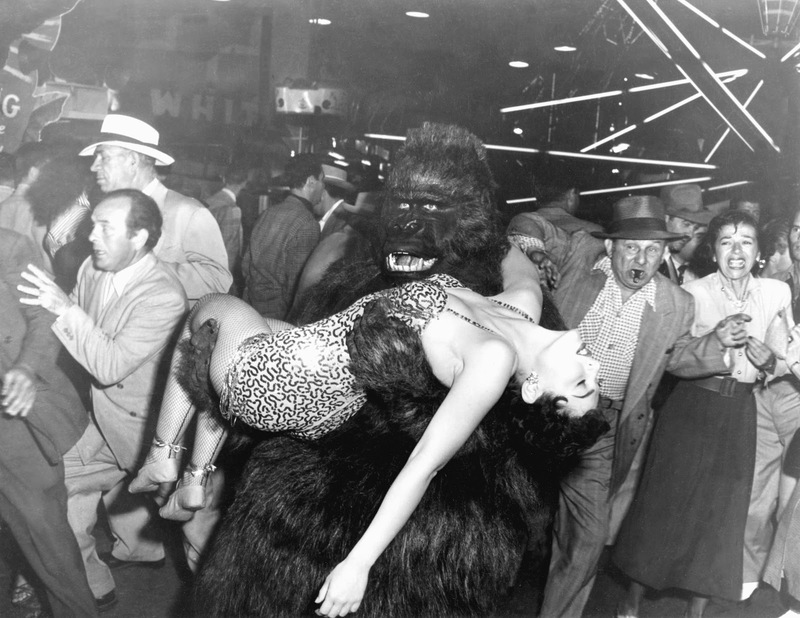 Lucy...you got a lot of splainin to do ! 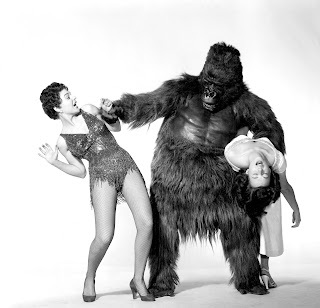 Lucille Ball tussles with Hungarian monkey man Janos Prohaska, on the set of "The Lucy Show". 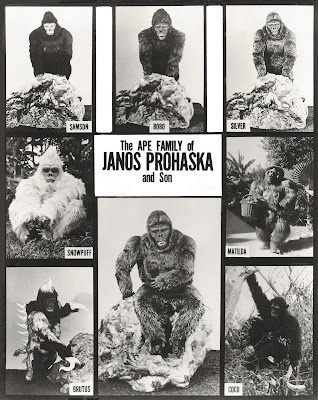 This was Janos's white gorilla suit known affectionately as "Snowpuff". 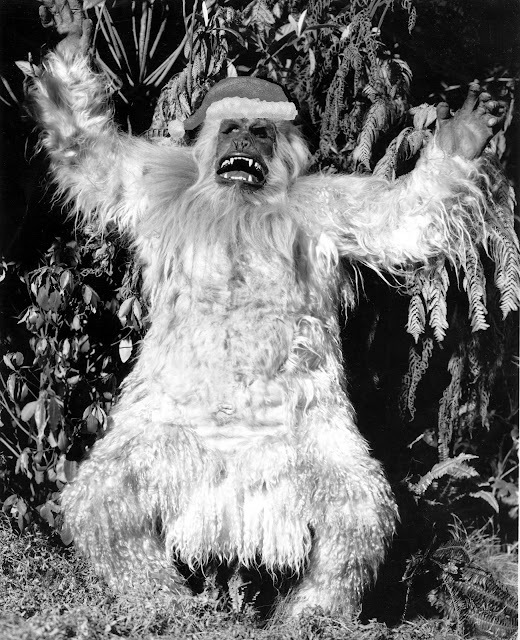 Snowpuff, was also featured on Voyage to the Bottom of the Sea as a rampaging albino gorilla, and most famously,as the fierce "Mugato" on the classic Star Trek episode "A Private Little War." The appearance on the Lucy show, got to show some of Janos Prohaskas comedy skills for a change of pace, and a considerably gentler side of "Snowpuff". Dynamite ! magazine by Schoolastic Books. I remember bringing home the order forms for the latest selection of books. 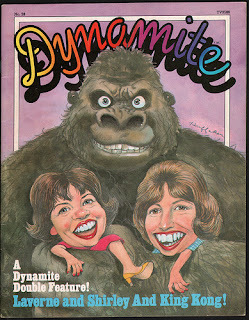 and give me the money to order the next great issue of Dynamite ! 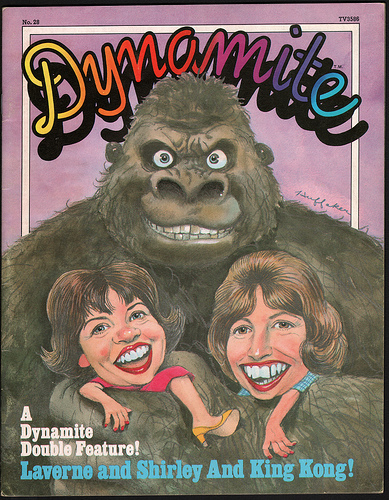 This particular issue featured the unlikely pairing of King Kong ( the Delaurentis version currently in theaters at the time) and Laverne and Shirley, (a top rated TV series at the time). It makes no sense at all, but that was part of the coolness of Dynamite ! I have to admit to having a special place in my heart for those who have come to known as "little people". and if not for medical science, my youngest son would have also been small. 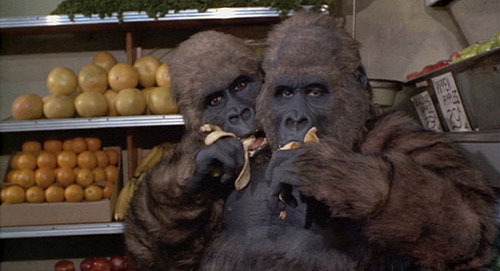 So when I saw the two gentlemen seen here, I was immediately intrigued, because they were little gorilla people. 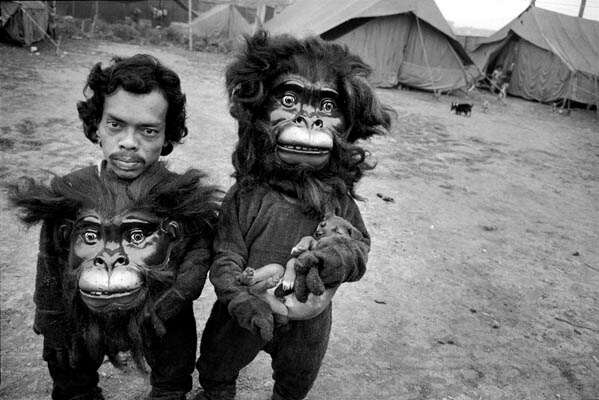 The two fellows here, Tulsi (sans mask) and his twin brother Basant,( holding puppy) worked as clowns in the Great Famous Circus, in Calcutta India, seen here in 1989. They are dressed in comedic gorilla attire for one of their performances. That's a show I would have loved to have seen ! 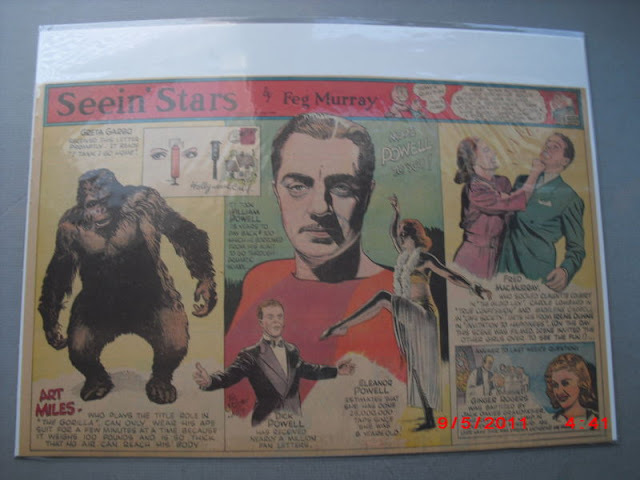 Gorilla great, Art Miles actualy received a little press for his gorilla efforts in a Sunday Funnies newspaper strip called " Seein' Stars" by collumnist Feg Murray. 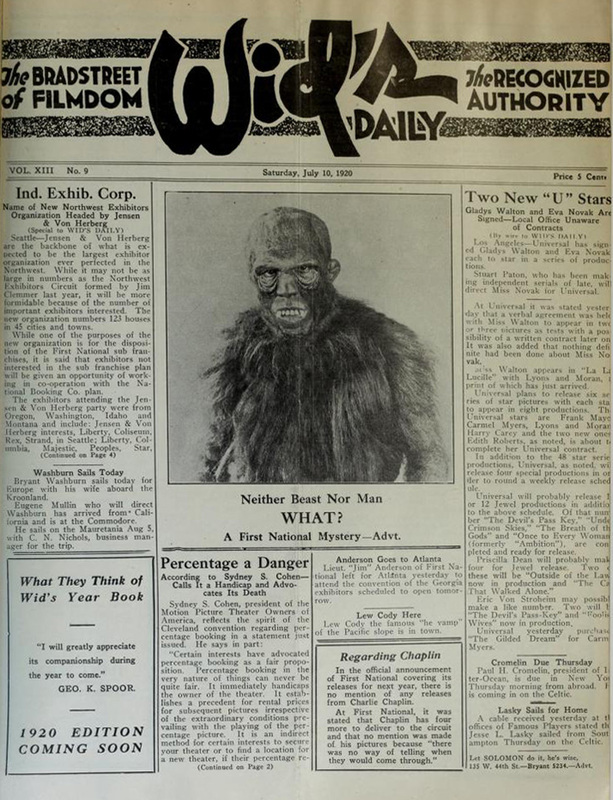 The strip was the entertainment equivelant of the popular Ripley's Believe it or Not ! sindicated newspaper strip. 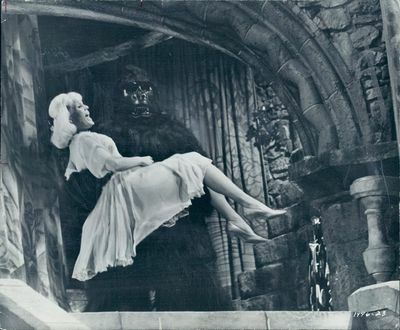 one of the promo shots for the Ritz Brothers Classic, "The Gorilla ". You can see Art, pitting his formidable gorilla skills against the Ritz Brothers here ! 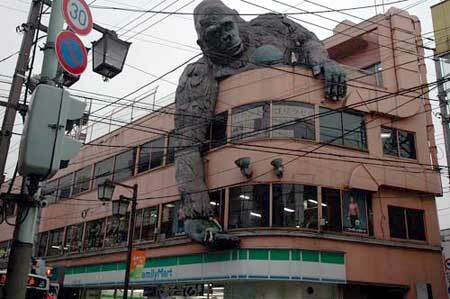 Ya gotta love a city that has such a love for giant monsters, that this type of decoration is commonplace! One of the goofiest gorilla gags in films I've seen in a long while, was in the classic spoof "Perils of Pauline" 1967. 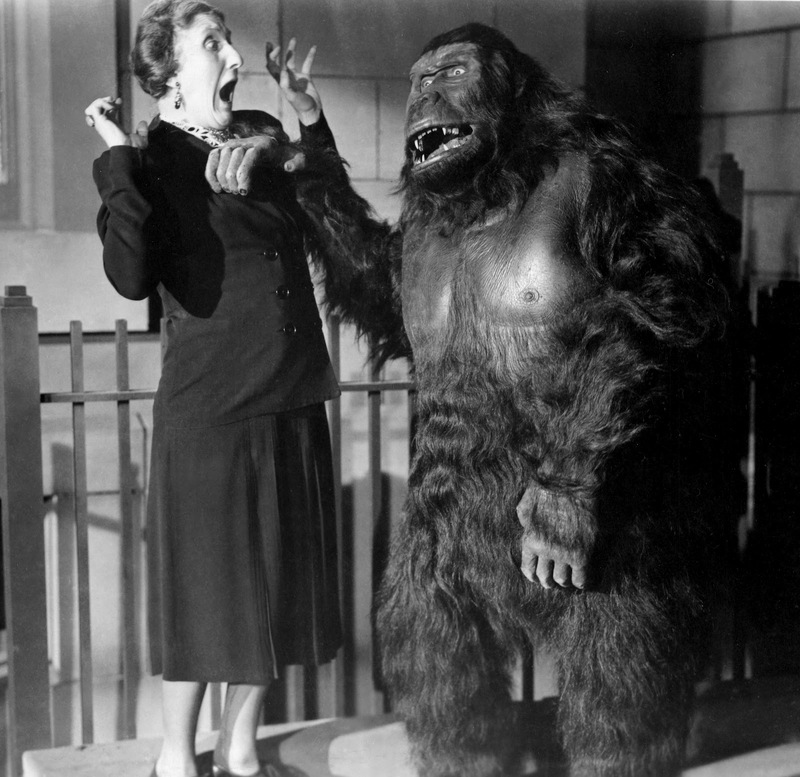 The set up is the classic "confusing a real gorilla for a guy in a suit". The confusion is only the beginning, the ensuing chase that follows is completely nuts ! Rather than try to describe this lunacy, you can see it right here, all cued up and ready to go. 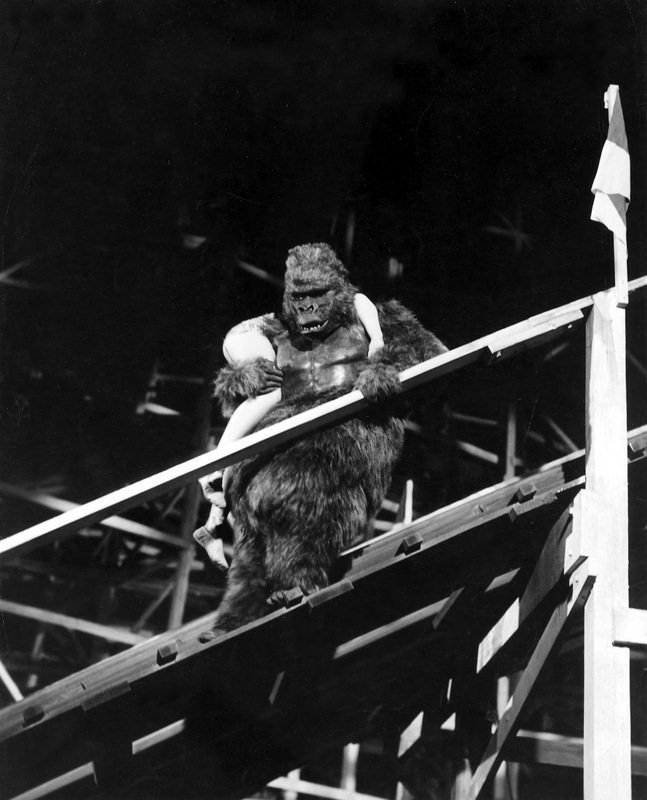 The gorilla action starts a minute or to into the clip and runs to the end. You can watch the entire movie if you are so inclined by clicking the various chapter tabs in order . The guy in the "fake" monkey suit is veteran British comic actor Terry Thomas. The "director" is played by character actor Vito Scottie. 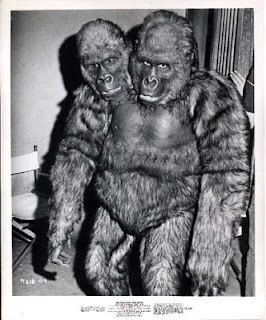 The costume was made by the famous Don Post Studios, makers of the greatest masks ever ! The head of this furry fellow was sculpted by the incredible Marcel Delgado . 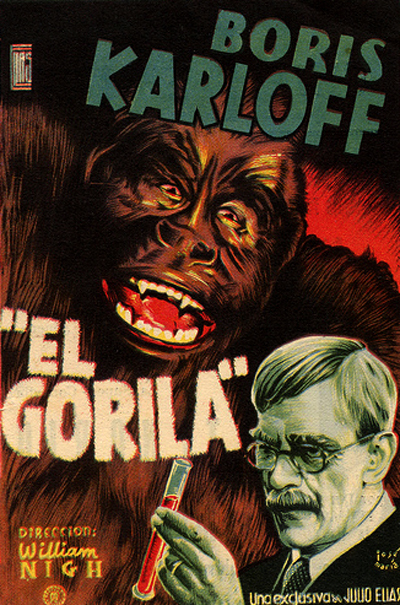 If his name doesn't ring a bell, Marcel is the artist who sculpted and fabricated the 1933 King Kong stop motion puppets ! 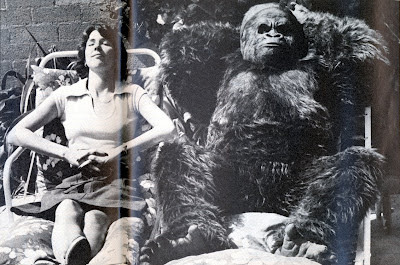 To say Mr. Delgado knows apes in an understatement. Here is were it gets a little weird....originally, the ape in Perils of Pauline was to be a white gorilla. As bad luck would have it, it was decided after the suit was finished that they changed their mind and would rather it were a traditional dark gorilla.....The next morning ! 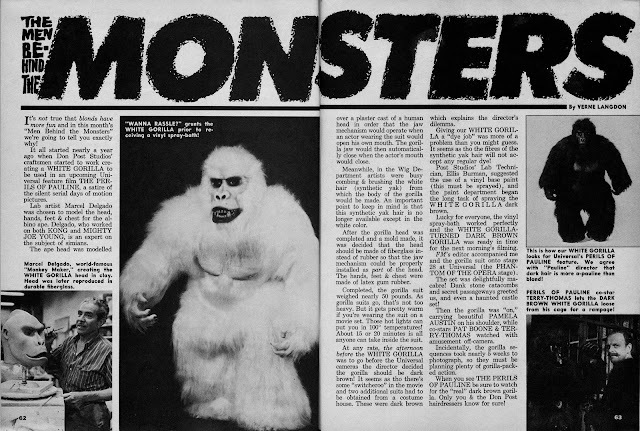 Here is the tale as printed in the pages of Famous Monsters of Filmland. The sculpted gorilla truly is an amazing piece. It was later reproduced in latex rubber and sold by Don Post studios as part of their catalog. 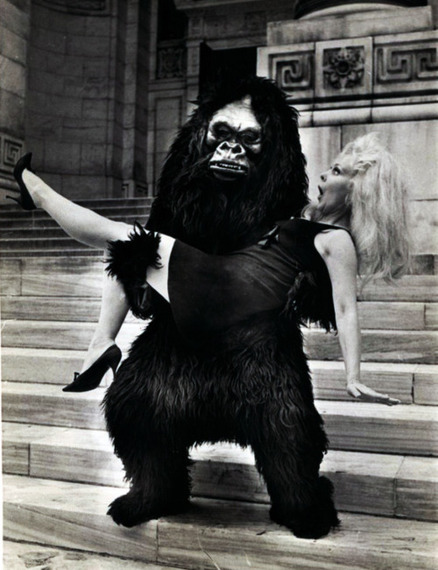 The Delgado gorilla as it's come to be called was used for studio rental suits and appeared in this famous pose with the stunning Raquel Welch as Blonde Venus !